These Olympics are in some city in Europe. But they are brought to you by the PEACOCK! I am a self-confessed Olympics junkie. When I saw the parade of nations in Albertville in 1992, I was hooked, and it continued right through. I’ve watched all the Olympics—Barcelona, Lillehammer, Atlanta, Nagano, Sydney, Salt Lake City, Athens, Torino, Beijing, and now London. I love everything about it—the mere idea that for two weeks the world can come together for something as simple as sport, that feats of human strength unite us all, that it is open to everyone to create a miracle. And of course, there is the dazzling pageantry. I love pageantry. with his alien blue eyes and preternaturally preserved features has narrated me through every record, every fall, every triumph. I know the tune of “Bugler’s Dream,” NBC’s Olympic theme tune, better than the Olympic hymn. I looked forward to the athlete profiles, and even the cheesy commentary of the deeply involved commentaries, in particular gymnastics and diving, where the commentators love to hiss and coo as they play enthusiastic judges. I even got used to the ethnocentric coverage where it became easy to think that Team USA was the only team in the Games. I grew used to it, but it always did bother me, that unless an athlete was nominated as worthy of a four minute profile which showed the difficulties of growing up in post-Soviet Ukraine, or communist China, or unless an athlete did something as amazing as Usain Bolt, I never saw them. I also have a penchant for knowing everything about an Olympic event, crawling behind the scenes. I wanted so badly to know what it’s like to actually be there. But the NBC coverage is so frenetically paced and carefully packaged, there is none of that raw realness in the coverage. I forgave them this, figuring that was how televised Olympics were always meant to be. Witness the video from Sydney below, which has it all: sweeping aerial views of the city to the ubiquitous Bugler’s Dream, Bob Costas, and lots and lots of drama. Doesn’t he just make you want to shout “Yes, Bob! *I* am ready!”? Until I started watching BBC coverage. It is amazing. The BBC has no less than 20 channels devoted to Olympic coverage. Not only is this all live, but there are no commercials. Not a one. British people pay for tv licenses, and this tax goes to funding the BBC, and means that it doesn’t have commercials. This is amazing enough, but the other beauty of the coverage is there is no packaging. They turn on the cameras and let them roll. If I turn on swimming, I get to see the entire meet as if I were there, each race in the order it comes, each heat and semifinal. I get to see the athletes get introduced, not already standing on the blocks, and at the end they show the medals ceremony in full, and I can hear them play the theme to “Chariots of Fire” as the champions walk out. Watching gymnastics, I get to see the athletes warm up, the Olympic volunteer coming out with a hook to stop the rings from swinging. It is actually as good as being there. Even better, the commentators are much more about giving necessary information without any of the cheesiness of American sportscasters. As I write this I’m watching the Men’s Individual All Around in gymnastics, and on the dismount from the rings the British gymnast took a huge step. I can hear the commentators in America saying “Oh, *big* step on the landing—that will cost him.” But the British commentators instead focused on the fact that he did a double twist instead of one and a half twists. Despite the British propensity for self deprecation and caution, these announcers are particularly optimistic, which is really nice to hear. 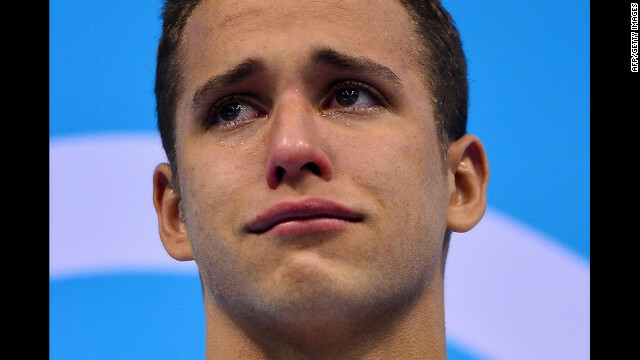 When Michael Phelps lost to South African Chad le Clos, they focused on the Le Clos’s tears and pride in his own stunning victory rather than the fact that Michael Phelps lost. Look at that face! If you are not crying along with him you have no soul. I’ve had the amazing good luck to actually go to an Olympic event—football (soccer) in Coventry. It wasn’t the best game—a rather lacklustre showing from New Zealand and Belarus, but it was still pretty fantastic to go. They’ve opened more tickets, and if I weren’t getting married and going on a very expensive honeymoon, I would spend every spare penny to go. But at the same time, I feel like I don’t really need to. The only thing I’m missing is actually being there and cheering along with everyone else. And for the record, in my living room I’m cheering as hard for my newly adopted country as I am for my native country. 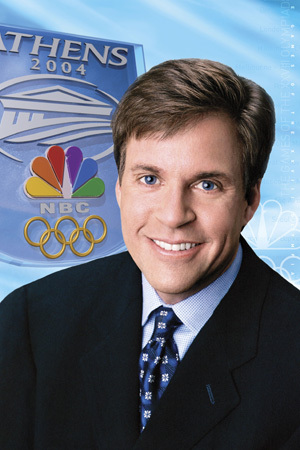 Although I do miss Bob Costas. …which may or may not look like certain animated characters doing certain things to their animated brothers. You prefer the BBC over NBC?! COMMUNIST!! !